I'm ashamed to say that even though I've had my iphone since October of last year, I have yet to commit to a case for it. (I know. I live on the edge.) This is less about the abundance of adorable cases out there and more to do with the fact that the hard ones don't seem to protect much in the event of a crash. So I've been eyeing a few different skin options lately instead. 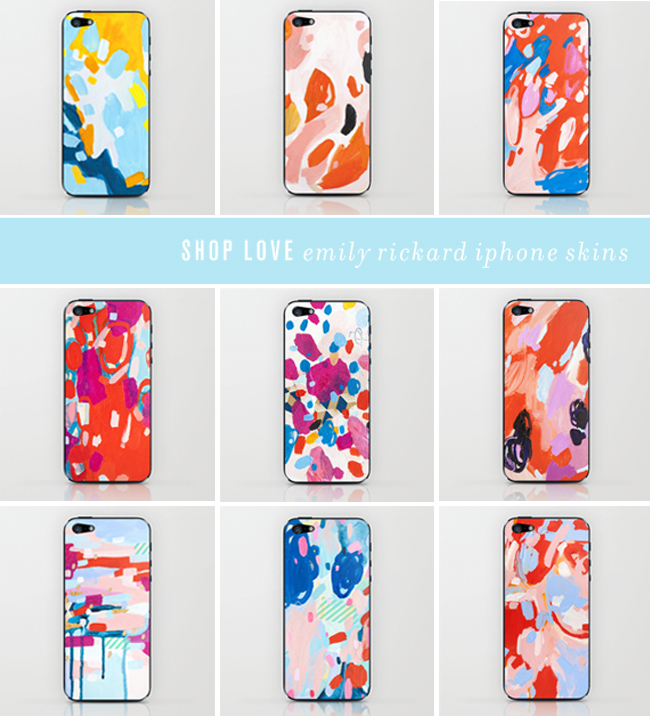 These beauties by Emily Rickard sure would make a colorful statement, no? Problem is, I'm going to need one of each! Oh really? I have a hard one, drop it ALL the time and my phone seems to keep ticking. I have a few cases. It's not a big expense and I like to mix it up. These are cute too. These are sick. Love the bottom row, I will definitely be checking these out. Thanks for sharing! i wish i could change my iphone case as often as i change my clothes. there are so many adorable ones out there. these are INCREDIBLE. lovelovelove! I love her work, big fan! i am in the same boat as you, got the phone maybe two years ago and have yet to put a case on it. I am pleasantly surprised that its not shattered yet! Love these, I have an otter box and it's not very cute but definitely durable.